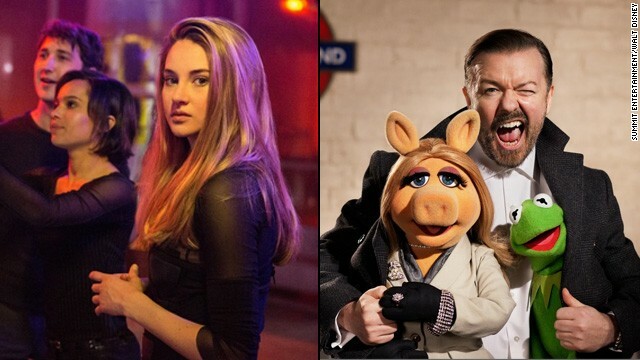 'Divergent' vs. 'Muppets': Which are you going to see? At the box office this weekend, one of YA's biggest hits is facing off with a beloved crew of fuzzy entertainers. In the eyes of critics, the new potential blockbuster "Divergent," based on the book by Veronica Roth, is no match for the follow-up to 2011's "The Muppets," "Muppets Most Wanted." On Rotten Tomatoes the dystopian adaptation is rated just 41 percent fresh, with beleaguered critics picking on its similarity to a certain other popular teen franchise set in the future. Despite a strong performance from Shailene Woodley, many of those who viewed "Divergent" were left feeling underwhelmed. Wall Street Journal: "'Divergent' ... is not only a waste of time for anyone safely out of adolescence, but a waste of Ms. Woodley's special gifts." USA Today: "'Divergent' covers well-trod turf that brings to mind 'The Hunger Games,' 'The Matrix' and a slew of other post-apocalyptic tales. Ironically for a film about non-conformity, it adheres to the playbook rather slavishly. ... Despite two strong lead performances and a welcome dose of female empowerment, this somber tale feels too familiar and formulaic." New York Times: "(Y)ea for 'Divergent,' a dumb movie that I hope makes major bank if only as a reminder of the obvious: Women can drive big and little movies, including the pricey franchises that fire up the box office and the culture." New York Magazine: "If you can forget what it’s saying, 'Divergent' is fairly entertaining. ... But the second half of the film is edited too quickly, probably to cut down on the running time but maybe also to ensure that all violence remains safely in the realm of the kid-friendly PG-13." Yet when it comes to "Muppets Most Wanted," the second "Muppets" movie from director James Bobin, critics were more entertained, making it 77 percent fresh on Rotten Tomatoes. It's not as great as 2011's "The Muppets" - it has neither the heart nor the consistent humor - but it does its job. USA Today: "Refreshingly wholesome and cleverly campy, it's a family film that should appeal to a wide age range, though not every joke hits its mark." New York Times: "The best Muppet movies have been great because they had charm. There’s no charm here, really; just self-referential jokes, decent but not memorable songs, and lots and lots of cameos (again, for the adults; not many children are going to be impressed by the presence of Stanley Tucci or Frank Langella). It all adds up to an eventful entry in the Muppet film library but not a classic one." Washington Post: When 'The Muppets' came out in 2011 ... millions of relieved fans flocked to see their beloved yarn-and-wire characters mix it up with Jason Segel and Amy Adams in what amounted to Muppets 2.0. 'Muppets Most Wanted' can’t rebottle that particular brand of lightning, but it does a terrific job trying." Los Angeles Times: "(T)he filmmakers forget to include as much of the emotional quotient as we expect from the Muppets. Underneath all that fuzz, their humanity is their heart. Still ... it is hard not to have a good time anyway." With those kinds of reviews, which movie are you planning on seeing? If you believe interracial relationship,you cannot miss it . This is a group where all members believe Interracial relationship-> ____ MixedPartner.c o m ___~ --A Serious interracial dating site for singles seeking relationships, friendships beyond race and borders. No matter what is your color,SIGN UP to have a special mixed partner.Do NOT miss it,that won't let you down.